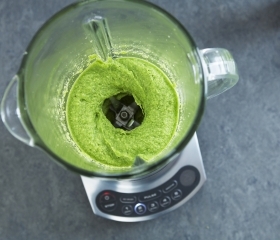 Have you made Basic Basil Pesto? 1. 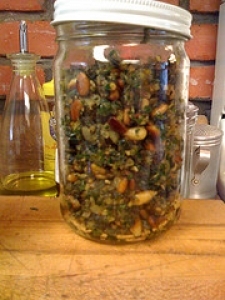 In food processor, combine basil, parsley, garlic and pine nuts. 2. Pulse until finely minced. Add cheese and process to blend. 3. With machine running, drizzle oil through feed tube until desired consistency is reached. 4. Transfer to small bowl and cover with plastic wrap (press directly to surface to prevent discoloring). 5. Alternatively, cover surface with thin film of oil or place pesto right into plastic bag. 6. Store in fridge for up to 1 week. 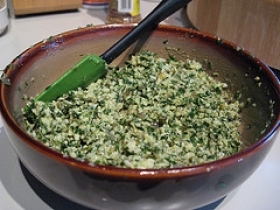 Tip: If you only have curly parsley, use 1/2 cup. 7. 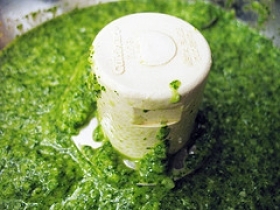 To freeze pesto. 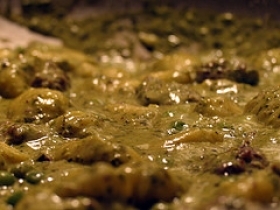 Prepare as above, omitting cheese and using smaller amount of oil. 8. Place in freezer container, covering surface with film of oil or in freezer bags. 9. Ice cube trays may also be used - once frozen, transfer to freezer bag. 10. Will keep in freezer up to 6 months. Thaw in fridge, not in microwave. 11. Stir in cheese after thawing. 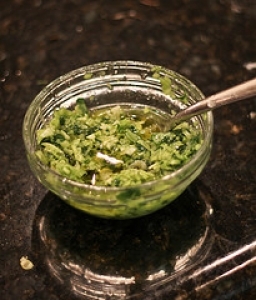 (Tip - to perk up color after thawing, stir in 2 tbsp chopped fresh parsley) Variations. 12. Instead of pine nuts, use other kind of nuts. 13. Toast first to enhance flavor. 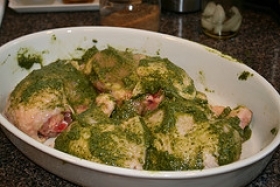 For lower-fat version, reduce oil to 1/4 cup and add 2 tsp lemon juice and 1/2 cup chicken stock. 14. Or, replace some of the oil with sun-dried tomatoes. 15. Use immediately. Use half Parmesan and half Romano cheese Use roasted instead of fresh garlic. 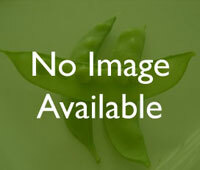 This recipe contains potential food allergens and will effect people with MSG, Cheese, Garlic, Olive Oil allergies.